Authored by simgunz on Feb 24 2018, 4:17 PM. Mark the annotations that contain a non-empty popup. Especially useful to identify annotations that are not meant to contain an annotation as shapes or highlights. Problem: The side review is updated only when the mouse is hovered over it. It should be updated as soon as the content of the popup is changed. To do this the method notifyAnnotationChanges of DocumentPrivate in document.cpp should be made public so that it can be connected to the signal TextChanged of the textEdit in annotwindow.cpp. Doesn't an asterisk after a title typically denote an unsaved file? Maybe we should come up with a different UI metaphor here. Put the annotations containing a popup note in italic? Not my favorite choice though. I would like something subtle. Do any other software has this functionality? Can we get inspiration from them? 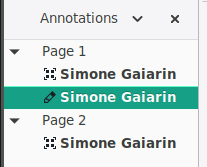 Maybe we can add a small icon with a pencil (similar to the one in the evince screenshot) next to the annotation somewhere to mark that the annotation has a text note associated. 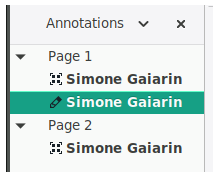 The approach of foxit reader is best for me: one have a full view of the annotations in that way and can interact with the annotations in the side pane directly. The current approach of Okular does provide very little info. I'm not sure i'm a fan of using an icon for this. For me seems a good short term solution. What is the best way to implement this? Given the call to i18n I guess I cannot just append a suffix to ret. I guess I do not need to add "with Comment" to Pop-up note and Inline note given that they always have a comment. Pop-up note can have empty contents, but i guess since contents it's its main focus we can leave it out? I have created a new revision D12013 by mistake. That can be deleted. I have removed the commit with the asterisk I have added before, because when I just tried to revert it phabricator was complaining and didn't let me update the revision. Is pushing a rebased branch to the phabricator diff a bad practice (usually it is in git)? Yes. I also didn't add "with comment" to "Caret" for the same reason. You're not really pushing a "branch" with arc, you can think of it more as a diff describing a range of commits. By default Arcanist takes all commits between HEAD and the merge-base of your branch and its upstream tracking branch, i.e. likely master, but this can be changed, of course. See https://secure.phabricator.com/book/phabricator/article/arcanist_commit_ranges/ for more. IOW, you should be able to do pretty much want you want on your local branch without having to fear to break something in the upstream Git repo (unless you git push or arc land). Also, in general I'd expect you could just arc diff over a commit range containing a local revert. I cannot say too much without knowing details about "complaining and didn't let me update the revision", but given your accidental new Diff it seems to me that you got in a situation where arc got the commit range wrong, i.e. it could not find a commit containing the "Differential Revision" line, so it could not attach to that. Use arc which before arc diff to get more information about what Arcanist will do. You're not really pushing a "branch" with arc, you can think of it more as a diff describing a range of commits. This is indeed what I believed. My doubt is: when you want to review a "review" what do you do exactly (I never did it). You download a patch and apply it manually to your code (probably arc does this with some command)? If I overwrite some commits, as I did today, does it create any problem to the reviewer that already "pulled" from arc the review once? (in git this will create diverging branches between local and remote) Or does arc redownload the diff completely each time, so avoiding problems? IOW, you should be able to do pretty much want you want on your local branch without having to fear to break something in the upstream Git repo (unless you git push or arc land). This was not my fear, but I feared to mess up things to the reviewer that already "pulled" the review before. Also, in general I'd expect you could just arc diff over a commit range containing a local revert. I cannot say too much without knowing details about "complaining and didn't let me update the revision", but given your accidental new Diff it seems to me that you got in a situation where arc got the commit range wrong, i.e. it could not find a commit containing the "Differential Revision" line, so it could not attach to that. Can you explain this better? I've never written any "Differential Revision" line in my commit messages explicitly. Does arc produces new commits with this line? Use arc which before arc diff to get more information about what Arcanist will do. Thanks. That is something I was looking for. I should re-read the phabricator guide more often. I'll also have a look at T7116 and maybe I can give some feedback from a point of view of a newcomer. Anyone wanting to review or simply try out a patch usually just issues arc patch D10797. This will make sure the repo is up-to-date to be able to find the commit you attached your revision to, create a new local branch named arcpatch-D10797, download all dependent revisions and finally apply the patch. In case the author updates the patch, the reviewer will re-issue arc patch D10797, get a new branch called arcpatch-D10797_1 and so on. Note that on these branches there is only a single squashed commit per Diff, i.e. (at least currently, might change in the future) what you see in Revision Contents → Commits is only visible on Phab. To investigate what the author changed, the reviewer could compare both local arcpatch-* branches, but I guess most people just use the options for comparing revisions under Revision Contents → History, or click on the email link leading to the same comparison URL. Phabricator remembers all Diffs you uploaded. arc patch will simply re-download the complete patch, using the latest revision unless you specify an older revision. Nothing to fear. If it looks good in the Diff viewer on Phabricator, it will look good for your reviewer. Ah, my comment might have been misleading. This line will only get added once you do arc patch or arc amend. However, you won't need to issue those commands or even add the line manually, because Arcanist will do it for you once you arc land. There is a second way arc diff can recognize the revision, which works by comparing your local commit sha with what has been recorded on Phabricator (IIRC – if not, arc which will tell you the real reason). If you change things in such a way that the recorded commit sha on your local branch is missing (which should not happen if you just add a reverting commit), then you'd have to manually provide the ID of the Diff. Edit: Or did you mean with "reverting" that you did a git reset --hard <sha>? In that case Arcanist obviously has no way of knowing the relationship with any of the 10,000 patches on Phab and your local checkout (short of comparing the title, or the diff itself, but this is not reliable…). There is a second way arc diff can recognize the revision […] (IIRC – if not, arc which will tell you the real reason). Hm, I guess that was wishful thinking from my side. Upon arc diff Arcanist will just add the "Differential Revision" line with the Revision ID obtained from Phab to the local commit message. This means that indeed somehow you must have been removing the commit containing that message from the commit range Arcanist looked at.